468 pages | 65 B/W Illus. 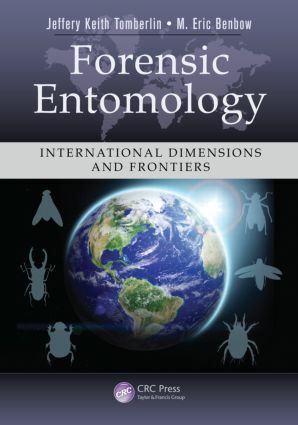 Dr. Jeffery Keith Tomberlinis an associate professor and co-director of the Forensic & Investigative Sciences Program and principal investigator of the Forensic Laboratory for Investigative Entomological Sciences (FLIES) facility at Texas A&M University. Research in the FLIES facility examines species interactions on ephemeral resources such as vertebrate carrion, decomposing plant material, and animal wastes to better understand the mechanisms regulating arthropod behavior related to arrival, colonization, and succession patterns. His research is also focused on waste management in confined animal facilities and the production of alternate protein sources for use as livestock, poultry, and aquaculture feed. Dr. M. Eric Benbowis an assistant professor in the Departments of Entomology and Osteopathic Medical Specialties at the Michigan State University. The research in his laboratory focuses on microbial–invertebrate community interactions in aquatic ecosystems, disease systems, and carrion ecology and evolution. All of these research foci use basic science to inform applications in forensics. He is regularly invited as a speaker at international and national academic meetings related to forensic entomology and has led workshops at the international level discussing experimental design, statistical analyses, and the importance of novel basic ecological concepts in advancing the field of forensic entomology.